Great location for a fishing holiday. The Captain's Cabin offers great value accommodation in a great location, just half a block from the lake and the supermarket, cafes and hotel. It's an easy walk to everything. The cabin opens onto a back patio with outdoor seating and a quiet, green, quarter acre block that provides plenty of secluded parking and room for kids and pets to play. You can park your car and boat in the privacy of the paddock behind the cabin. There is also room for off street parking in front of the cabin. Free mooring is available at our jetty 100m away. Plus a double sofa bed in the lounge. Linen, bedding and bath towels are provided. Beds are made up ready for your stay. This is a fully self contained cabin with a well equipped modern kitchen, including a dishwasher, 4 element stove and full oven, microwave, kettle, toaster and full size fridge-freezer. There is also a Weber gas BBQ on the front verandah for outdoor cooking. The cabin has it's own laundry facilities comprising of a washing machine and clothesline. For relaxing indoors there is a separate lounge room which has extra seating for dining, lounges and a large digital TV with DVD player. This is a pet friendly accommodation. The cabin has a grassy front yard which is fully fenced and secure for pets. Pets are welcome inside when you are in, and are safe in the fully fenced front yard when you are out. The Captain's Cabin offers lots of space for activities both in the front and back yards. You can park your boat right near the back door, hose it down, and keep an eye on it while you have a beer on the back patio. It is a half block stroll to the back entry of the hotel which offers excellent evening meals. The Captain's Cabin accommodates 6 people. Queen bed in main bedroom, single bunks plus trundle in 2nd bedroom, single bed in 3rd bedroom, and a double sofa bed in lounge room. Linen is provided. This is great value accommodation for a group or family. Yes, the cabin has 2 air conditioners. Our fees cover the lot. We do request your credit card # to cover occasional damage to fittings. We do not charge for pets or additional bedding. However - please bring your pets bedding so they feel comfortable. Full size electric stove and oven, microwave, kettle, toaster. Full fridge with freezer. Cookware and utensils provided. Private gas BBQ. The Captain's Cabin has a bathroom with shower and wash basin plus a separate toilet. Very. The Captain's Cabin is fully fenced with capacity for secure boat parking. The grassy front yard is secure for pets. Check out our other listings. 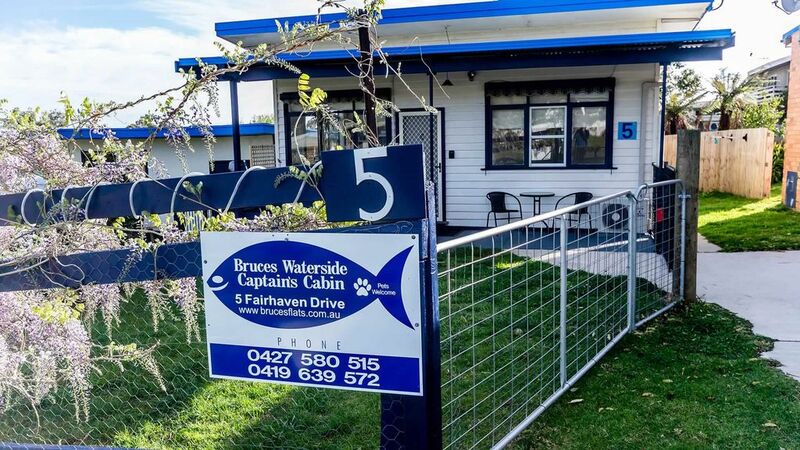 We have 4 types of accommodations at Bruce's Waterside Units, all situated between Mallacoota town centre and Coull's Inlet. If you are looking for something unique with a perfect view straight to the jetty check out our listings for The Fisherman's Cottage (next door) and Dot's Lakehouse (across the road). Want the view, but need something smaller? Check out our 2 bedroom Waterside Units - Bruce's Waterside Units 6 & 7. If you are looking for a wheelchair-friendly unit or easy walking distance to town check out one of our economical two bedroom Village View Units - half a block from the shops and also from the water - Bruce's Village View Units 1 & 2. All accommodations are pet friendly, offer Free Wifi, are fully self contained within walking distance to town and lake and come with a free mooring at our jetty in Coull's Inlet. Great place to stay. Secure yard for young kids to play in. Spacious parking for boat. Lou ge manager was great at communicating prior and during trip. Would definitely stay again. Thank you. Thanks Aaron, thank you for the kind review. It was great to have you and I loved glimpsing your family enjoying themselves. We'd love to have you back. We really enjoyed our 2 nights here. This has obviously just been painted and the kitchen updated. Good heating, even though there is no carpet. The big windows in the kitchen and back area mean the place is light filled all day. I'm guessing they'll update the crockery by summer. Hi Peter, thanks for staying. So glad to hear you found the cabin warm and sunny during winter. I appreciate your feedback and have now updated the crockery. nice clean cabin.had everything we needed. loved the location.not far to walk to anything. my family and I enjoyed our stay in this cabin.it was very clean and tidy had everything we needed.was so close to township.great for walking to.the hotel has lovely meals and very friendly.we were lucky to be in Mallacoota when the market was on enjoyed having a look at it.the beaches are just lovely the kids had so much fun.we enjoyed the fishing.not that we caught much through the day.the guys did catch a few from the jetty near cleaning tables of a night.the kids enjoyed walking around the town and caravan park and seeing the kangaroos.it was very nice to hear from louise when we arrived making sure we were happy with the accommodation and if we needed anything just to let her know.my family and I would highly recommend this property . looking forward to next time we go to Mallacoota. We all enjoyed our stay here, has everything you need and is close to everything in the town, would definitely stay here again.